Although my role as Team Leader is for the Olympic Games, I do want to give a shout out & support our fiercely competition Paralympic athletes who are also taking the opportunity over the winter months to hone their skills in preparation for the 2012 Paralympics. 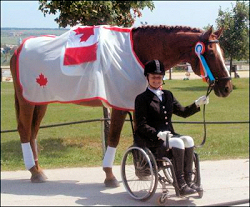 There are a number of Canadian Para athletes who can be found in the dressage ring this weekend at the Global Dressage Festival in Wellington, Florida, and many were in the show ring today. Multiple Olympic medallist Lauren Barwick and Equine Canada’s Off to Paris rode to victory with a 75.833% (Grade II Team), with Ashley Gowanlock and Maille not far behind with 72.045% (Grade 1B). Also competing was Jody Schloss (70.588% in Grade 1A) and Robyn Andrews (68.088% Grade 1A). If you recognized the name of Ashley’s horse, that’s because it is the one & only Gold & Silver Paralympic horse of Lauren. Lauren very graciously gave the ride to Ashley to help her in her Paralympic dream pursuits. Talk about being a team player! Canada qualified a team spot for the 2012 Paralympics by putting in some stellar performances at the CPEDI3* in Portugal last December.